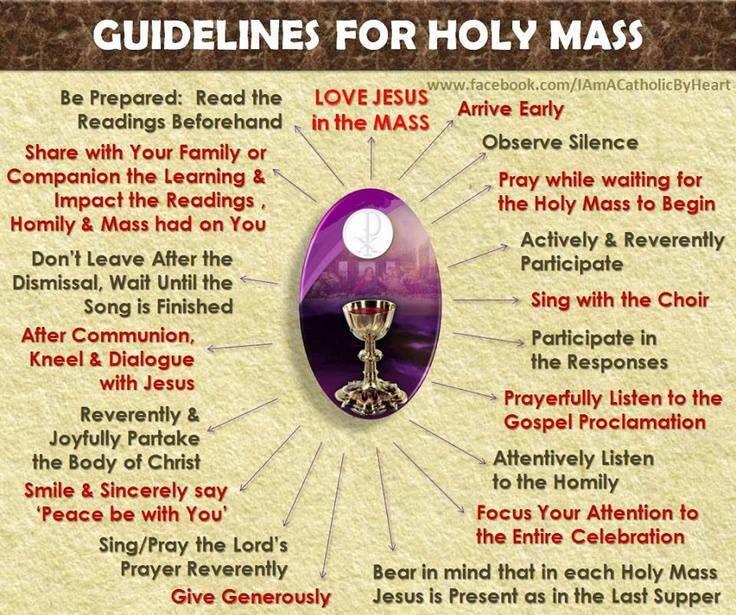 Catholic News World : #HolyMass Etiquette: #Guide of 10 Things To Do And Not Do In Mass to SHARE with Video! #HolyMass Etiquette: #Guide of 10 Things To Do And Not Do In Mass to SHARE with Video! Hour Fast before Mass. The law of the Church says that one should fast for 1 hour before receiving Holy Communion. Water and medicine can be consumed any time. This is to prepare to receive Jesus in the Eucharist. No Food and Drink in Church. Water is used by the priest or choir and water for those who are ill. Exceptions are made for small children. Chewing gum in church is not appropriate. Chewing gum breaks your fast, and is considered impolite in a formal setting. Dress modestly and suitably. Wear your Sunday Best to Chuch. Sleeveless shirts, mini-skirts, extremely tight clothing, shorts, see-through clothes and low-cut blouses are not appropriate. Cell phones should never be used in Mass. The exceptions are emergencies. If you need to, please walk out of church to do so. It is appropriate to use the phone for readings or prayers, but try to be discreet. When entering and leaving Church, genuflect toward the Tabernacle. Christ is present in the Tabernacle. With the touch of our right knee to the floor, we adore our Lord and God in the Eucharist. If someone is physically unable to genuflect, then bow. During Mass, if you pass in front of the altar or tabernacle, bow reverently. Please be quiet in church. Once you enter the sanctuary –try to be silent. If you must talk do so as quietly and briefly as possible. Remember that your conversation might be disturbing someone in prayer. Bow before receiving Holy Communion. Show your respect with a bow of the head or genuflexion. This is an traditional practice that has continued until this day. Do not leave early. We should stay to the end of the procession and the hymn that accompanies it.